An elderly woman suffered serious puncture wounds from two pit bull mixes last Friday as she was trying to protect her small Pomeranian while walking on Ponte Vedra Beach. Unfortunately, her efforts to save her dog were unsuccessful. The woman not only lost her beloved pet, but also sustained numerous dog bites on her ankles, hands, thigh and knee. One of the pit bulls had previously been designated as a dangerous dog and the owner had been cited several times. When this happens, the owner is legally responsible for taking extra precautions, such as leashing and muzzling the dog in public, spaying or neutering, microchipping and keeping the dog under control physically. At the time of the dog attack, the two pit bulls were unleashed and playing the ocean with a man who was caring for the dogs at the time. Upon seeing the pit bulls, the woman ran toward her home with her small dog in her arms, but she could not run fast enough. The dogs knocked her down, attacking her and killing her Pomeranian. The man caring for the dogs inadvertantly strangled one of the pits in an effort to restrain the dog. Per county ordinance, the other dog was executed. This disturbing story reignites the ongoing controversy about pit bulls. Are they all dangerous or have a few aggressive pit bulls given the entire breed a bad name? Pit bull attacks have been in the news many times here in Jacksonville. Pit bull lovers are passionate in their belief that the breed has been unjustifiably labeled vicious while others, especially dog bite victims and their families, believe these dogs are genetically predisposed to attack. Ironically, sometimes it is the dog owner who suffers the attack. Not too long ago, a 42-year-old woman was fatally mauled by her two pit bulls in Middleburg. The dogs also attacked the woman’s son and a sheriff’s deputy before both dogs were shot. Dog attacks involving children are particularly disturbing. According to People for the Ethical Treatment of Animals (PETA), nearly 500 people, mostly children, have been injured or killed by chained dogs in the past 10 years. Last spring in Jacksonville, A 17-month-old child was killed by a Rottweiler when he wandered into a neighbor’s yard where the dog was chained to a pole. •	Do not let a dog run loose. •	Keep all vaccinations up to date. •	Keep the dog away from strangers’ paths, especially children. •	Display warning signs if you think your dog may injure someone by coming onto your property. 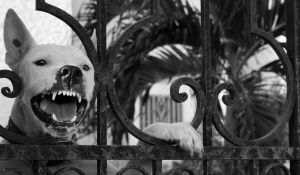 It is not uncommon to hear news reports in Jacksonville about a dog bite or dog attack. Often, the victims are children who have wandered off into yards where dogs are not fenced or restrained. Unfortunately, some dogs go into “protect mode” and inflict wounds that can be very serious and sometimes fatal. The Centers for Disease Control reports 4.5 million people in the U.S. are bitten by dogs each year. One in five of those victims – about 885,000 people – require medical care and approximately 31,000 require reconstructive surgery as a result. In Florida, more than 500 residents on average per year require hospitalization for dog bite injuries. On average, two Floridians die annually as a result of injuries sustained by dog bites. Unfortunately, Florida’s dog bite injuries are highest among children between the ages of one and nine. Boys are more often the victims of dog bites or attacks than girls. In addition to suffering the physical injuries and mental effects of a dog bite, victims also need to consider the possibility of infection. The rabies virus is transmitted primarily through animal bites and is more common in Florida than most other states. Bacterial infections are another potential complication from dog bite injuries. Be sure to seek medical attention to determine if additional cleansing or suturing is required. In addition, many people are not aware that dog bites can cause tetanus, so ask your medical provider if you require a tetanus shot. – Do not approach a stray or unfamiliar dog – Teach kids to ask the owner’s permission before approaching or petting an unknown dog. Tell kids not to hug or kiss the dog, as face-to-face contact is a common cause of dog bites. Instead, if the owner says it is okay, tell kids to approach a dog by petting their backs or sides first rather than placing their face directly in the dog’s face. – “Freeze” if a strange dog approaches – Teach children to stand still, like a tree. Eventually, the dog will lose interest and go away. This works for strange dogs as well as the family dog if he or she gets a little aggressive. If your child gets knocked down, teach him or her to roll up on the ground and remain still. – Do not tease a dog – Do not ever disturb a dog when it is sleeping, eating or protecting something. Their predatory instincts will prevail. – Avoid Direct Eye Contact – Many animals, including dogs, may react to eye contact as a threat. It is not unusual for them to attack in this situation if they feel threatened. A Jacksonville woman developed reflex sympathetic dystrophy (RSD) after being attacked by a dog on her own property. The dog bit deeply in her arm, but the wound itself was not severe enough to require stitches. After being initially seen by doctors she was sent home. Within days she developed a serious infection of the wound site. The infection was followed by the onset of severe burning pain, color changes, a cooler temperature in the arm, and abnormal hair growth on the arm. Unfortunately, all of these are classic symptoms of RSD. RSD, previously known as Complex Regional Pain Syndrome, is a serious, usually permanent neurological condition that is usually caused by an injury to an extremity. This situation highlights the very serious nature of dog attacks. Every year, we hear of people seriously injured or killed by pet dogs in Jacksonville. Children are the most frequent victims of dog attacks, accounting for 70% of dog attack injuries. In the United States, there are almost 600,000 dog bite wounds that require medical care each year.